The Boy Scouts of America designates the Sunday that falls before February 8 (Scouting Anniversary Day) as Scout Sunday, which is the primary date to recognize the contributions of young people and adults to Scouting. However, each chartered organization can use either of two other options to celebrate this special day. An organization can adopt a specific Sunday to celebrate. 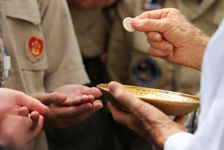 In the instance of the United Methodist Church, Scout Sunday is celebrated on the second Sunday in February. It also is permissible for a local church to celebrate on the Sunday most acceptable to the pastor and congregation. Learn more about Scout Sunday at the National BSA site. Scout Sabbath offers an opportunity for worshippers to honor Scouts and Scouters, as well as to learn more themselves about the value of Scouting as a youth program chartered to a Jewish organization. It gives a rabbi a framework to address Scouts directly, in addition to speaking about Scouting to the congregation. Scout Jumuah is the primary date to recognize the contributions of young people and adults to Scouting within the Muslim Community. Masajid and other Islamic institutions that charter Scouts or who have Muslims in Scouting, should use this day to celebrate and highlight their achievements as well as highlight the need of working with the youth in the Muslim community. 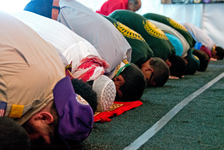 For more information on the Scout Jumuah please see the National Association of Muslim Americans on Scouting (NAMAS) website. To encourage members to grow stronger in their faith, religious groups have developed religious emblems programs. The Boy Scouts of America has approved these programs and allows the emblems to be worn on the official uniform. The various religious groups administer the programs. Check with your local council service center or contact the religious organization directly to obtain the curriculum booklets. Download the Duty to God handbook below to learn about the approved emblems. To serve as a chaplain or chaplain aide is a unique opportunity for ministry. While serving in these offices, you will have the opportunity to help Scouts as they grow, both physically and spiritually. Some techniques to be used are modeling, mentoring, and offering faith-based experiences. Use the handbook below to help you become better oriented to the duties, responsibilities, and opportunities of chaplaincy service in Scout BSA troops and Venturing crews.